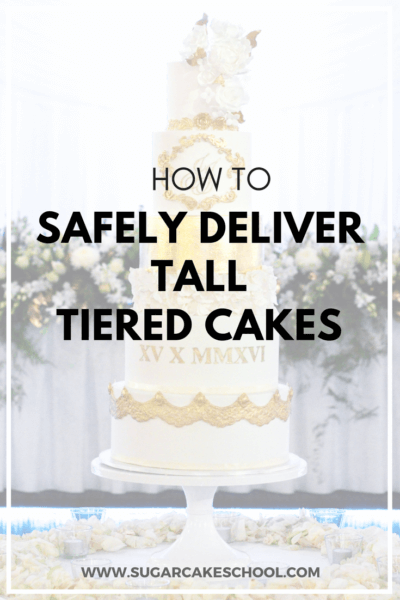 Tips on how to safely Stack & Deliver Tall Tiered Cakes. The complete guide on how to safely transport tiered cakes. There ain’t no stress like a wedding cake delivery stress. If you’ve made (or are planning to make) tall tiered cakes, you would be all too familiar with the nervous churning in ya gut prior to transporting your cake to the venue. Nightmares of fallen cakes, dropped cakes & snapped decorations are all too real in the profession with virtually every cake decorator having a story to tell. My disaster story happened fairly early on in my career… In short, I was travelling an hour out to the country via windy lanes with a slender, buttercream beauty when an oblivious cyclist unexpectedly swung out directly in front of my vehicle, forcing me to slam on the brakes. Then I heard it… the blood-curdling, soul-quenching “thud”. My 20-hour-labour buttercream beauty had submitted to gravity and was jostling about it’s box as I was forced to continue my drive up the narrow, windy lane. Enduring the walk of shame past the wedding planner, into the fine-dining venue, I spent the next hour frantically re-icing the entire cake (it ended up looking exactly as it did prior to delivery thanks to some nifty saves which I’ll be outlining below). Moral of the story…? Take all necessary steps to ensure a SAFE & secure delivery. 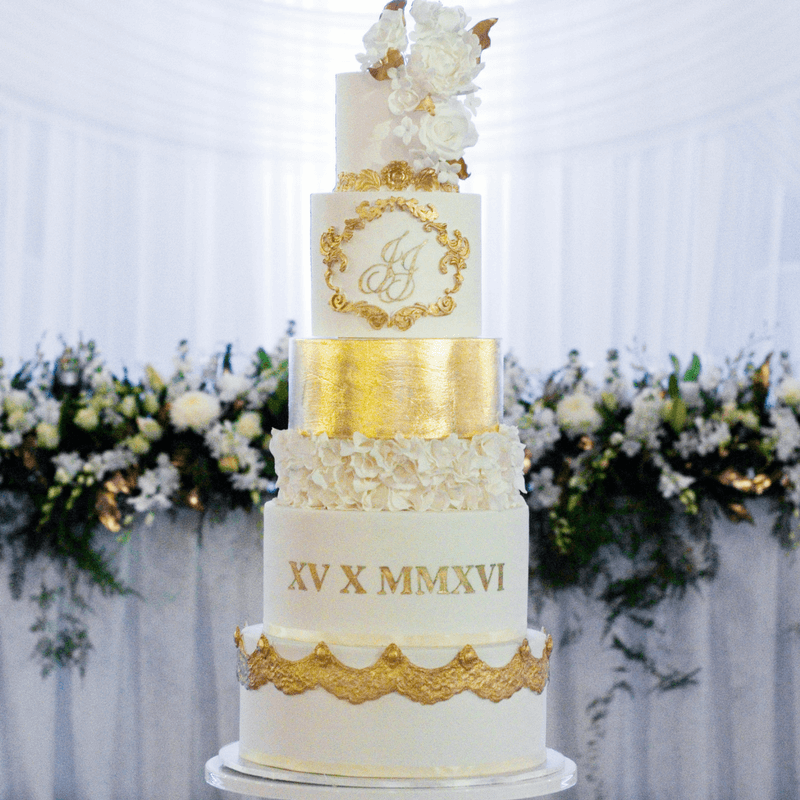 So you don’t ever have to endure a similar trauma, I’ve compiled a complete A-Z guide outlining the fine details of how to safely transport tall tiered cakes below. From important stacking techniques, to on-site fixes; you can rest easy and drive with the music cranked up whilst your cake masterpiece is safely nestled behind you. Had I properly stacked my cakes with the inclusion of an all-important central dowel system, I would have very likely spared myself the fallen-cake-fiasco. Hands down the most secure and sturdy method to stack your tiers is by first dowelling each individual tier (except the top one of course). These tiers are then built around a central dowel construction which holds all the tiers in place. I cannot recommend this method of stacking quite enough. It allows you to confidently deliver your cakes whilst knowing that there stands a strong spine holding your towering masterpiece together and firmly acnhoring it to the base board. You can get my step-by-step detailed instructions on how to properly Stack Cake Tiers & Build a Secure Central Dowel structure in this tutorial here. 5 tiered cakes and over: The bottom 3-4 tiers are centre dowelled & assembled . The remaining upper tiers (usually all foam) are fully assembled as a separately stacked “fake cake”. The bottom section & upper section are boxed separately and transported to the site as 2 separate sections with the upper section attached to the bottom section at the venue using royal icing. *Note: I would not recommend having ALL CAKE tiers for anything more than 4 tiers. I learned the problems of this the hard way when I ambitiously constructed an all-cake 6 tier wedding cake which, though delivered to the venue in pristine condition, subsequently succeeded to snap my gleaming new $100+ stainless steel cake plateau like it was a flimsy child’s plaything. Simply explain to your clients that due to structural risks, anything above 4 tiers needs to be made partly in foam (upper tiers). It ain’t ever a good idea to rock up to the event venue unannounced. Despite receiving confirmation from the client of the address, delivery times & other details…I always recommend ringing up the venue directly approximately 1 week or a couple days before the event date. Some venues only open for short windows of time during event day or have specific parking zones for deliveries which you would need to be aware of beforehand. Other situations I’ve encountered are venues with a long dirt-road entries which require some preparation for (e.g. more spare sugar flowers needed in the event of breakage!). So yes, its always, always beneficial to ring up beforehand and chat to the corresponding event manager. You should also brief the organiser of your anticipated delivery time as this will help ensure that the cake table is prepped and ready before your arrival. Very likely, at least 1 out of 10 wedding cakes is going to need a fix at some points. Be it minor or major, you certainly need to be prepared. With every tiered cake I deliver, I pack along a kit with tools & materials that will allow me to fix up the cake in the unlikely event of a mishap. The kit is different every time depending on the type of cake that is being delivered. Buttercream cakes would obviously mean additional frosting and spatulas need to be brought along whilst fondant cakes will require additional fondant, a mini rolling pin, a knife, a bag of icing sugar and spare decorations. The best thing to do is to think of what is likely to be damaged mid delivery and to prep your kit according. Make sure you have ample time to make your way to the venue. Under no circumstances do you ever want to cut it fine as sometimes, delay factors do unexpected crop up. Always aim to have your cake delivered at least 2 hours prior to the event start time to account for slow traffic, roadworks or unexpected damage. My personal policy is.. the earlier, the better! A majority of venues have walk in coolrooms where you can store your cakes for a couple of hours prior to the event (if it’s warm in your locality) or you could otherwise request to have the cake in air-conditioning. It goes without saying, you’ll most certainly be driving at “granny” speed most of the way. I would suggest having some form of “Cake Delivery in Progress” sign which you can purchase online or have custom-made. This will help ward off dreaded tailgaters & hot-collared motorists, thus affording you the luxury of an uneventful ride. Before lugging your cake to the front door…the first thing you should do the moment you arrive is to conduct a brief preliminary scout. If you have another person in the car, ask that person to stay in the delivery vehicle with the air-conditioning running or if you’re by yourself, leave the cake in the locked vehicle momentarily (obviously without the engine running) and make a beeline into the event space. Ask for the event manager or coordinating staff and after introducing yourself, confirm where they would like the cake to be positioned. You would then be able to unload the cake(s), cake stand and any remaining equipment from the vehicle to complete your cake set up. Hold ya horses… it ain’t time to make a run for it yet. There are 2 crucial actions you should take before leaving the premises. The first thing is to collect evidence of a safe delivery & set up. This might sound excessively cautious, but I have heard of countless incidences of cake makers being wrongfully blamed for cake damages by venue staff or other causes in their absence. So take a photo or two of the completed cake set up, even a simple iPhone snap would do. The next thing to do is to pass on all cake-related instructions to the event manager/coordinator. Speak to the person in charge and provide any relevant information such as portion sizes, tier flavours, dietary specifications, decorative elements that need to be removed etc.. I normally have all this information typed up beforehand on a form that I refer to as a Handover Sheet. In addition to this, I have a separate form for the event manager to sign to which I ask them to confirm that “The cake has been received and set up in proper condition”. I also include a term in this signed form that “Any damage to the cake caused in any way by the venue, factors within the venue’s control or hired staff/clients whilst the cake is kept at the event location is at the responsibility of the venue”. This is a form that I keep as insurance in the event of any unforeseen accidents that occur after I’ve completed my delivery. And that’s it! You tiered cake delivery is DONE & DUSTED. You can now have full permission to bust out a happy dance and return home after a good day’s work. So tell me dear reader, what you concerns you the most about tall tiered cakes? Hi! Do you have a tutorial on how to decorate dummy cakes? I hear People using the foam all the time! But it seems like such a hassle. Looking forward to your response. Thanks for all of your help. This arrival is amazing thanks. I was just wondering of it is possible for you to post your handover sheet for cake delivery? Thank you so much Amanda for this blog post – so helpful for us bakers starting out. Just a question regarding the handover form – do you have a template of this that you can share? I’ve never thought to have one, but after reading the blog, not everyone knows everything cake, so I can see how helpful it would be, rather than blabbering on about everything to venue staff and risk the chance they forget something crucial. Thank you! Great article!! How to you attach each of your buttercream tiers? Do you dowels each tier and attach with buttercream and then another long dowel down the center? Hi good day, I’m a novice and I’m doing my first wedding cake delivery tomorrow please God. It’s a 6″, 9″ and 12″ 3-tier cake. Can that be delivered already stacked? It will be logged up a flight of stairs.my concern is not the transportation, but the journey up the stairs. I’m delivering my first 9×10 double barrel today. 😳 So, you know I have read every article on the topic. This was very validating for me. Thanks! What time frame would you recommend I should drop the cake off? How many hours before they are due to arrive at the venue? In my experience, I usually deliver at least 2 hours prior to an event in the unlikely event of a delay, or needing to fix something (you just never know sometimes). If the cake was going to be outdoors, I would then ask the venue to keep the cake in an air conditioned room or walk in cooler and get them to set up the cake themselves just before the event starts. If you choose to do this, remember to take a quick phone picture of proof that the cake delivered to the venue perfectly, and also get them to sign a waiver or a Handover Form (see my Business section for templates of this) 🙂 hope this helps!